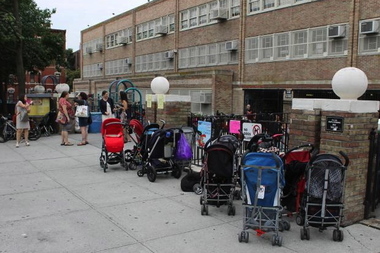 Strollers outside P.S. 321 on the first day of school in 2013. BROOKLYN — Park Slope's popular P.S. 321 was flooded with kindergarten applications this year from families who claim to live in the school's zone — but the school's principal suspects that at least some of them are lying about their addresses. P.S. 321, at Seventh Avenue and First Street, received 280 in-zone kindergarten applications for this fall, up from about 200 last year, according to the school and the Department of Education. Liz Phillips, P.S. 321's principal, said she believes the spike was at least partly caused by the new Kindergarten Connect system, which allowed parents to apply for kindergarten online for the first time. "We believe that this extreme spike in enrollment may be due to the fact that families could apply online without proving addresses," Phillips wrote to the school's staff this week after angry and concerned parents began reaching out. "We believe that this extreme spike in enrollment may be due to the fact that families could apply online without proving addresses," P.S. 321's principal Liz Phillips wrote to the school's staff this week. P.S. 321 has just 250 kindergarten seats, so the school was forced to waitlist about 30 zoned kids — which surprised local families, because officials recently shrunk the zone of the perennially overcrowded school as a way of preventing waitlists. Parents who received an offer to P.S. 321 this week will now have to go to the school to register in person by May 23, bringing documents including the child's birth certificate or passport and two proofs of their address, which Phillips predicted would expose those who hadn't been honest on their application. "We believe that some will be disqualified when they are unable to show proof of address, and that this will open up some seats, as will normal attrition," Phillips said. Waitlisted P.S. 321 families said they were stunned to learn this week that they hadn't received a seat in their zoned school. "We were shocked, upset and now worried when we found out we were waitlisted," said one Park Slope mom, who asked to remain anonymous. She lives a block away from the school and ranked it as the first — and only — option on her son's application. Instead, her son was placed in P.S. 118, about a 20-minute walk away, the mom said. "We don't actually know what our plan is now," the mom said. "We both work, and we have a 2-year-old as well as our soon-to-be kindergartner. So now instead of across the street, we'll have to have someone walk 20 minutes with our 2-year-old in tow each way." 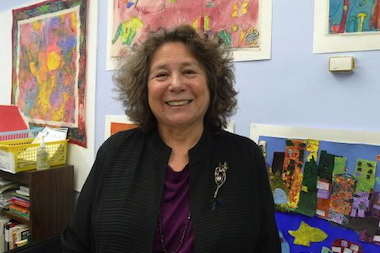 Brooklyn schools expert Joyce Szuflita, of NYC School Help, said she, too, was surprised to see a waitlist at P.S. 321 after the rezoning that was intended to shrink the incoming class, and particularly as the number of zoned schools with waitlists dropped by nearly half across the city this year. "I am mystified by the drastic rise in applications for in-zone families at 321 and the subsequent waitlist," she said. Waitlists often shift, Department of Education officials said, as families vacate seats for private or charter schools, receive gifted-and-talented offers or move. Phillips noted that zoned families have a right to return to P.S. 321 for first grade if they attend P.S. 118 or any other school for kindergarten. MAP: What Are Your Chances of Winning an Affordable Housing Lottery?